Ever since I can remember, I would start searching our house high and low for the Christmas presents about 2 weeks before Santa Claus was scheduled to arrive. I was really good at finding them, and also really good at not having my parents find out. Evidently it runs in the family because Kyle found our Christmas stash this year. Well I guess if you don't use your snooping skills on a regular basis then your snooper gets a little soft. Then you have snooper impotence and can't achieve or sustain a snooper to have satisfactory snooper activity. OK enough with the erection puns. On Mrs. Shife's side of the family, there are a quite a few of us so we just draw 1 name to make it easier. My father-in-law got my name this year, and I sent him a few ideas like a tool box or some tools or some other manly things I could use in my garage. Since Mrs. Shife is well aware of my snooping past, she advised her Dad to send the present over to her sister's house so I would not try to be tempted to snoop and figure out what I was getting. Well a few days before Christmas I was over at my sister-in-law's house returning something we had borrowed, and as I was making my way downstairs to return the borrowed item, I noticed a package next to the door. The box contained WeatherTech car mats. X-Ray vision? Sudden psychic abilities whenever I see cardboard? Nope. It was because WeatherTech plastered their name all over the package. I guess companies really like to market their name all over their packages so people know what is in there. I headed down the stairs to return the item but I was so jealous because I assumed my sister-in-law had bought those for her husband, and I have been wanting those type of car mats for a long time. I did not ask for them for Christmas because I thought they were over the budget we are expected to follow when buying gifts so I just spent most of day being envious of my brother-in-law's gift. The next day I was cleaning out the car, and jealousy reared its ugly head once more. As I was looking at our facotry-issued floor mats, I just wanted to do horrible things to them. Maybe get on a floor mat message board and sully their reputation. Degrade them with an barrage of profane words that would make my sailor buddies proud. Cheapen their existence by using them as welcome mats at a men's bathroom during an NFL game. I must digress for a moment. There are a lot of disgusting places on Earth, but a men's bathroom at a sporting event is surely one of them. Men really do not know how to pee straight especially if drinking has been involved. And you are just begging for trouble if you were flip flops in there. Anyway, as I was vacuuming the floor mats sucking up leaves, pine needles, mud, sand, food, wrappers, chia pets, unfulfilled dreams, etc. all I could do was think about those awesome car mats I saw at my sister-in-law's house and if I had them, then instead of vacuuming I could just take the new mats out and shake out all that garbage. Life would be sweet - yes I am a stay-at-home Dad with two kids under 4 so my dreams are not as robust as they used to be - and I could use all that time I was not vacuuming being more productive like thinking of ways to integrate Rafi quotes from "The League" into my customer service calls to DirecTV. My sister-in-law and husband were coming over later that day for dinner so I was hoping I could get some one-on-one time with her so I could find out how much the mats cost and other details. Well our solo time never materialized so I was just left with the dreams of adding the mats to my Amazon wish list and hoping I could get them soon. Fast forward to Christmas, and I see the present from my father-in-law under the tree. It does not look like a tool box or some other manly thing that could help me make loud sounds in the garage. However, it did look exactly like the package I saw at my sister-in-law's house except now it was all dressed up with some fancy wrapping paper and a bow. Unfortunately, since my snooping skills are now as bad as any Nicolas Cage movie in the past 5 years, I did not put it together. I opened up the gift, and just started laughing because I had seen my present but did not make the connection because I am no longer a successful snooper. And the whole time my sister-in-law was mad and worried because since she left the present in plain sight at her house she thought I had discovered what I was getting for Christmas. Good thing I have lost that snooping feeling. I am just as bad about it, though nowhere near as bad as I was when I was a kid. If karma is real, Colin's presents are going in a safe deposit box from now on. I would snoop and go so far as to unwrap an end to see what it was, if already wrapped. I know some people think it spoils it when you snoop and find out what you're getting beforehand, however, I was actually MORE excited b/c I knew what I was getting and couldn't wait to get it! Yes you have lost your Ninja skills, but just as well. It's more fun to be surprised, isn't it? My grandson might be kin to you, he snooped around and found his presents. I snooped when I was a kid but the prospect of a good thrashing but an end to it. Now I have the patience of Jobe. In fact I trained (yes trained) my family to wait for their presents until after lunch. Well, Santa is well known for being late where I live. It's amazing how well we can cope with severe anticipation...grins. Happy New Year, Matthew. BTW that's a cracking picture of the little man. congratulations on the new floor mats! looking back, i don't know if i was a good snooper or my parent just couldn't hide stuff for sour apples. I'm glad you got what you coveted! Sweet. 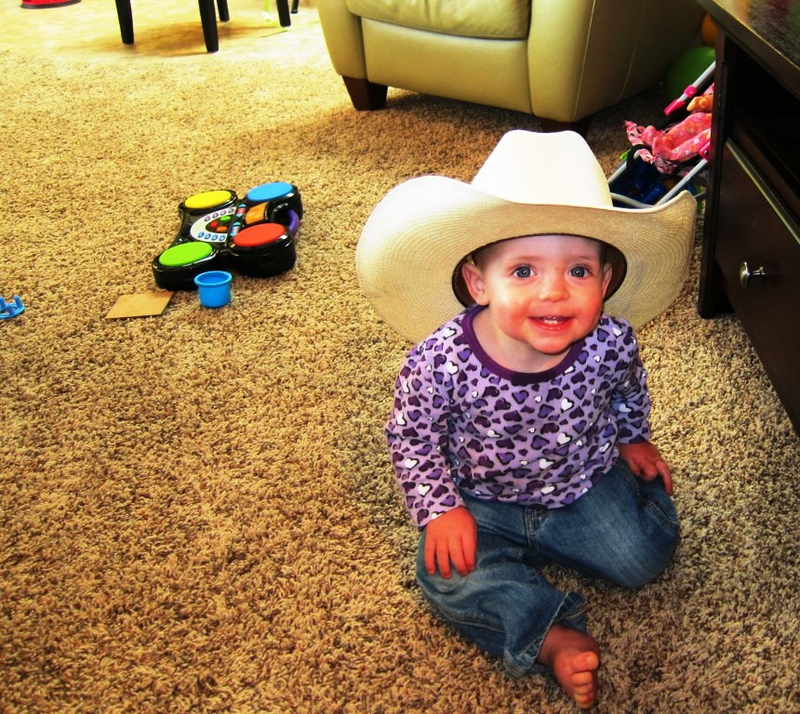 That little cowgirl is so cute! A Happy New Year with many blessings to all of you!